One of our family’s new year’s resolutions was to have Tuesday Game Nights! With a cupboard full of dozens of games, we we’re only missing one thing… SNACKS! These oven-rings are a much healthier take on that fast food favourite but is still packed with flavour and crunch. Feel free to pair with our ranch recipe, thai chilli sauce, or the classic ketchup. Whisk up Eggcitables in a small bowl, set aside. In another small bowl combine bread crumbs, parsley, garlic powder,onion powder, paprika, salt, and pepper. Place flour on a shallow bowl or plate. Dip onion rings in flour, fully coating them.Dip onion rings in Eggcitables mixture until fully coated, use the fork to drip off excess. Dunk the coating onion ring directly into the bread crumb mixture…swirl the bowl around and flip the ring until it’s fully coated in crumbs.Place on baking sheet. Repeat this process until all rings are covered. 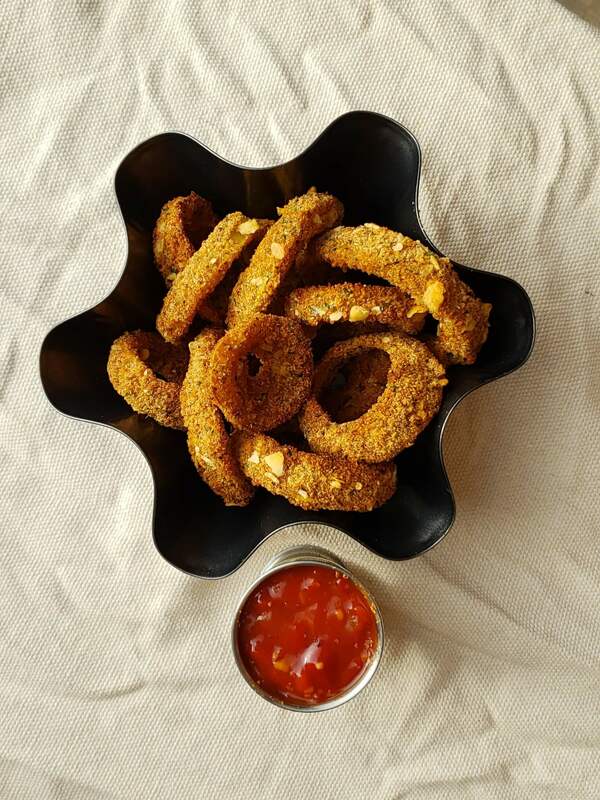 *Optional* Spray onion rings with a light coating of vegan cooking spray or olive oil… this makes them crispier. Bake in the oven for 10 minutes. Flip. Bake for an additional 8 mins. Let cool and serve with you favourite sauce…Enjoy!